A delicious spread in Stax, London. From calorie-laden burgers to New York-style pizza and southern soul food, our pick of the best American food joints in London. As if anyone really needs an excuse to indulge in gourmet fast food, the UK celebrates National Burger Day on the last Thursday of August each year: look out for discounts on burgers as well as limited edition recipes (burger flavoured ice-cream anyone?) in restaurants across the country. In honour of this icon of American cuisine, here’s our pick of the best American food joints in London. Delicious pizza from NY Fold, London. Bringing New York to the streets of London comes easy to Annabel and Michael Wheeler and as New York natives, it’s certainly no surprise. Residing in one of the chic streets of Soho in London’s West End, this gourmet and trendy pizzeria encourages you to fold your pizza for the ultimate double-dose-of-pizza-goodness. Dessert pizza from NY Fold in London. If you like your pizza that little bit fancy, try the Montauk; with tuna, olives, 100 per cent aged mozzarella, onion, olive tapenade and boiled egg. If you’re a fan of simplicity try the Grandma’s Pie; a combination of mozzarella and pecorino cheese, garlic oil, tomato, parsley and oregano. Either way, Bob’s your uncle! You’ve got yourself on the guest list for pizza heaven that’s open till late with a killer DJ. NY Fold’s sister eatery, Fold, opened in trendy London Fields earlier this year. Famous fried chicken and waffles from Dirty Bones in London. What do you get when two mates eat and travel their way through New York? They bring a piece of the Big Apple back home with them. The Mac and Cheese burger from Dirty Bones, London. American-style food that is home-made with a whole lotta love, the guys behind Dirty Bones know how to impress the hungry locals. Boasting bottomless brunch cocktails, Brooklyn-inspired beats and naughty-but-nice American food including tasty vegan-friendly tacos and burgers, it’s certainly no surprise that they’ve expanded, with locations spanning Kensington, Soho, Shoreditch, Carnaby and Oxford. Succulent glazed wings from Dirty Bones, London. Famous tacos from Dirty Bones, London. If the word ‘diet’ is a forbidden word in your vocabulary, then you’re going to love its cheesy truffle fries and crispy fried chicken with freshly baked waffles and maple syrup. After something a little more sweet? Try their homemade cinnamon sugared donut paired with the coffee gelato. On a diet? Don’t worry, you won’t be after you’ve dined here. Sumptuous delights from Dirty Bones, London. The impressive pancake stack from The Diner in London. If you’re after the good ol’ traditional American Diner, like your pancakes large and your burgers even larger, you’re going to love these diet-busting joint. 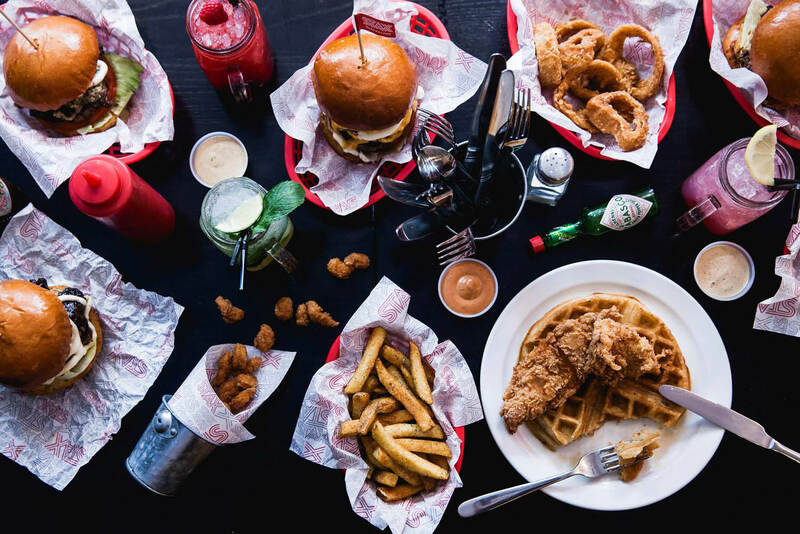 Located in various locations across town including Carnaby Street, Dalston and Camden, The Diner, as its name suggests, has a casual and relaxed vibe, perfect for over-indulgence and eating a day’s worth of calories in one sitting. If you didn’t come hungry, that’s OK. There’s salad. But who goes to a diner to eat salad? The three-stack banana pancakes with butterscotch sauce might change your mind. If that won’t do it, then the strawberry and chocolate pancakes certainly will. Oh yes, these little babies are drenched in chocolate with strawberries – you know, just in case you need to kid yourself you’re eating something remotely healthy. Travelling on the savoury side? Don’t go past their finger-lickin’ good ‘Diner Dirty Double Cheeseburger,’ paired with two beef patties, US cheese, pickles and Diner burger sauce. Wash it down with the Creamy Nut Hard shake; a combination of Bailey’s Irish cream, hazelnut and pistachio ice cream. Vegan? No problem! The Big V Dog with French mustard; a vegan twist on the traditional American hot dog, is also a crowd pleaser. Fancy taking a trip down to the American South? If you thought you knew what cheat day was, then you haven’t dined in at Carnaby’s STAX Diner. Taking feed your soul to an entirely new level, this comfy and modest space has a wonderfully tasty not-so-modest menu; and that’s exactly why you should go there. If you want to get straight into the southern specialties, you can’t go past the Stax Po Boy; Cajun spiced popcorn shrimp on an organic buttery soft bun with spice comeback sauce, lettuce and tomato. If you fancy yourself some traditional southern fried chicken, then the Spicy Hot Chickadee burger is the way to go, with its buttermilk marinated fried chicken breast, American cheese, onion rings and ranch dressing. If you’re after something small, try the Classic Buffalo Hot Wings with blue cheese dressing and celery sticks or the fried green tomatoes. Feeling super hungry? Then why not enter the Ultimate Stax Challenge to see if you can finish a five-beef-patty Stax cheeseburger, basket of Cajun Boardwalk fries and a super-sized milkshake in under 15 minutes. National Burger Day takes place in the UK annually, around August or September.